Good luck to Irish grade IV para rider, James Dwyer who will be competing at the first Qualifying Competition for the 2008 Paralympics. The competition will take place at Milner Downs in Langley, B.C. Canada on 1 - 3 September. James has ridden up to PSG level, and is currently training in the US. This will be the first opportunity he has had to compete on his new horse at international level. *Update: Well done to James for achieving 67% and 60% in the Grade IV Team and Championship Test, for 3rd and 4th place. Also, well done to our friend Jen McKenzie for being selected onto the Canadian team. Along with Karen Brain, Lauren Barwick and Eleonore Elstone, Canada look to have a very strong team - but the Americans and Australians will also be there so the results will be interesting. The Australian team under former Canada Team Coach, Mary Longden, are really taking things seriously. According to their website, they are intending to ensure 12-14 riders achieve qualification for Beijing, with the aim of getting their 5 top rides to the Paralympics in 2008. There is also talk of a Paralympic Qualifier in Australia in October 2007 where they would be able to compete on home ground on their own horses. Just picked up the September copy of Equestrian Plus magazine and found they've done a full page rider profile on me! What a nice surprise. Equestrian Plus is a free magazine which covers the North of England from South Yorkshire to Northumberland. You can also download it free from their website, which is a really good idea. They have lots of features and competitions and I find it really informative. Me and Hayley had qualified Indi and Winnie for the BHS Northwest Championships at Somerford Park on Sunday 3rd Sept. However, due to all the rain on the Saturday it was CANCELLED! We made a last minute entry to Aldham Mill BD comp and I rode Winnie in our first affiliated event together, scoring 62.5% in N24. Well done to Fiona Maynard who won both Elementary tests on Roderik. This was a good practice for both me and Fiona for the KBIS Championships at Stoneleigh on 15th September. We are both aiming to have one more outing before the championships. On 4th September, saddle fitter Elaine Farrant came to do the final fitting of my new WOW saddle. It's being funded through various charitable means, and I hope it will be a real asset to my riding. I think my horses will benefit from the air-filled panels as well - less pressure on their backs if I start to lean to the left. Elaine has put slightly more air in the left panel to help stop me twisting and my weight falling to the left. If you've never ridden in a WOW saddle you should try it - they are so comfy - for both rider and horse. With saddle fitter Elaine Farrant, and Carole Dickason from Otley RDA. Visit the Sponsors page to find out more about my recent sponsorship. I had been planning to take Winnie to the British Dressage Nationals, but just 2 days before the competition I manged to fall off her! We decided it was best to take Indi to Stoneleigh instead, so he was dragged in from the field during his planned week off, and loaded onto the lorry. Consequently we were a little out of practice, so our test on the day exhibited a few slight errors - hence my marks ranged from 3 to 8!! However, head judge Inger Bryant said she had been very pleased with the quality of Indi's work overall, which was nice. See competition page for results. On 25th September we are setting off to Belgium to represent Ireland at the Paralympic Qualifying Competition at Zilveren Spoor, Moorsele. There will be nearly 100 riders there, including all the Europeans, not to mention the Aussies and Canadians, so competition will be hot. However, Indi is on form and my aim is to try and get in the Top 12 - which will be difficult enough! The criteria for qualifying for the Paralympics are very complicated, but basically I need to score as highly as possible to get a good individual world ranking. 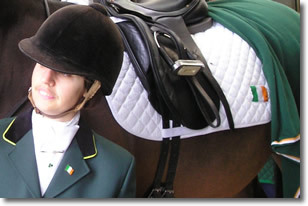 Riders who score over 60% at a qualifying competition can be considered for one of the 78 places at the 2008 Paralympics, but the chances of qualifying depend on many other factors. I have never competed in Belgium, before but everyone says its a great venue so I'm really looking forward to it. Find out more at www.quadrille.bz. See October for a full Diary of Events in Belgium 2006. Indi was a star on the first day and we came 7th in the Grade III team test with 65.6% . We have now both achieved the standard (over 60% at a qualifier) to be considered for the 2008 Paralympics, as has James Dwyer through his success at he Pacific Rim qualifier.